I have been working on walking. At first I just put a small amount of weight on my leg. I had to use a scale the first few days to measure how much weight I was putting on the leg. I was going too light and needed to put more weight on the leg. But I progressed slowly and this week I discovered I could actually hobble around the house without my crutches for a short period of time! I was so surprised and happy. Yesterday, I even walked on the treadmill for 20 minutes at 1.5 mph. Tanna had been off for a week because of wet weather (yay!! we needed rain). I didn't want him slipping in the round pen. But today, the pen was ok for working him. Daniel helped get him ready for me before going to work and then I headed down to the pen on the mower as usual. I parked the mower in the middle of the round pen and got off. 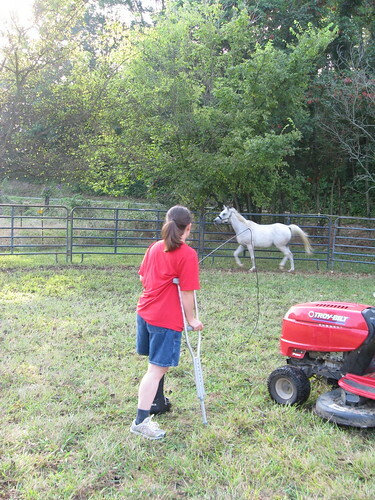 I secured my crutch in my right hand, the longe whip in the left (braced) hand and sent my horse to work. Off the mower, it was a lot easier to communicate with him. He responded well to my body language for turning, stopping, and coming in for a treat. No cantering today, though, and no really fast trotting. Just an easy time around the pen. You can see how much of a track he's worn around the perimeter of the round pen. After his workout, I asked him to walk to cool down. Then I moved our brand new mounting block near the fence and asked him to step between it and the fence. I stopped him and got up on the block like I was going to get on him. 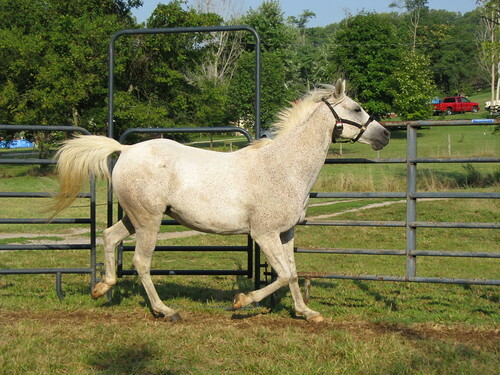 We bought a 19" tall step and it is going to be SO helpful when I start riding again. It will be super easy to get on. Tanna likes to turn to face me when I attempt to mount from a stationary object, that's why I had him next to the fence so he couldn't turn to face me. Here's the mower and the mounting block. Woohoo!!! I'm so happy you're doing well as that 100-miler approaches.